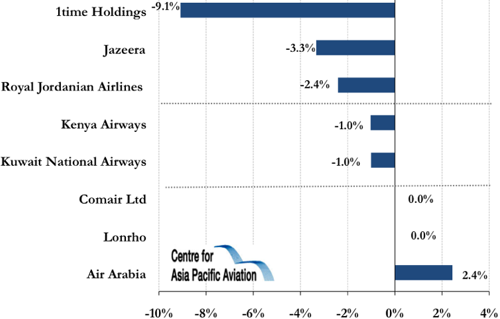 Royal Jordanian (-2.4%) fell on Thursday (17-Jun-2010) following a joint announcement with AWAS for the lease of seven new Airbus aircraft to replace six currently in the fleet. The lease involves four A320s, two A321s and an additional A320 to be assimilated into the fleet. HSBC Holdings upgraded Air Arabia (+2.4%) to “overweight”. Dubai stocks climbed the most in two weeks. In African news, 1time (-9.1%) and Kenya Airways (-1%) fell while Comair and Lonrho remained flat. See related Hot Issues profile on African Aviation.